Ensuring a secure seal is imperative for membrane roofs. Waterproofing your roof costs less than 2% of the average build budget. But it has arguably one of the largest impacts on the operating costs. Get it right, and you can greatly add to the comfort and value of a home or office … but get it wrong, and it could cost you your business. 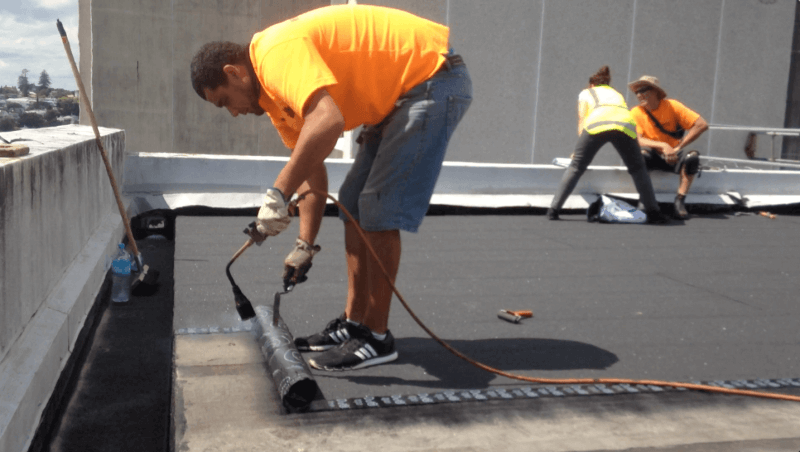 Polymer Bitumen Membranes (PBMs) have long been regarded as one of the best solutions for protecting your roof. These multi-layered sandwiches have different materials built in to increase strength, bonding and even fireproofing. They were first developed in the 1960’s by Italian company Vetrosfalto and are now commonly used throughout the world, particularly in the cool damp climates of Northern Europe. Failures in bitumen roofs are almost always attributable to errors made during installations. So it’s important to understand the pitfalls of these roofing systems. PBM’s come in two types, with distinct characteristics. Before talking about application, you must make sure you’re using the right membrane for the conditions. Earlier PBM’s were ‘APP modified bitumen’, which is plastomeric (modified plastic). These are more rigid, less malleable and require significantly more heat to fuse, but they are cheaper. Technological improvements led to the creation of ‘SBS modified bitumen’, or endomeric (modified synthetic rubber). In NZ we use predominantly APP’s due to their lower cost. But this is not necessarily the best choice, and more discerning architects and project managers are more frequently specifying SBS’s. Applying a naked flame to a building structure can have devastating consequences. Perhaps the most famous case of loss due to APP roof repairs was the Lincoln Library.] at the University of Kentucky, causing irreplaceable loss of American History. Note that it’s not the bitumen that usually catches fire – it’s insulation, or even just debris under the skin of the roof which smolders then ignites – often hours after the contractors have finished. As you would expect, when comparing rubber to plastic, not only is SBS more sticky and malleable that APP, it requires far less heat to melt, significantly reduce the risk of fire. 2 Injudicious uses of the blow torch. Apply too much, and you destroy it’s integrity, causing crazing, cracking,or blistering, and significantly shortening it’s life expectancy. Apply too little, and the layers don’t fuse properly, leaving loose laps and an insidious fault line for water to penetrate your roof. PDM sheets are rolled out onto the roof, and fused together into a single impermeable layer. To facilitate bonding the sheets have a strip down the side where the mineral chip has been omitted. These are called ‘Laps’. Care needs to be taken to ensure the sheets are all laid in the same direction, and that the laps are on the correct side (lap out, so it can bond to the bottom of the subsequent layer). Once heated to the precise temperature the laps are pressed together in a single watertight seam. If the heat has not been applied evenly you’ll have loose pockets where the bond is imperfect. Once the bond has set, it’s almost impossible to evenly reheat these pockets, and if you try you’ll almost certainly damage the membrane. Special care needs to be taken where the laps have been trimmed or shaped around objects (like skylights or pipes) since the laps will not bond directly to the mineral chip layer. In the case of APP you will need to scrape away the chips (but be careful not to destroy the composite layers), while with SBS you can simply use a heated trowel to push the chip down into the bitumen prior to bonding the layers. Another complication with the seams is joining two rolls together. Now rather than being just two layers thick, the corner of the seam will be three layers thick, as the top/bottom layers also overlap the sides. There’s a protocol for dealing with this, called mitring, which directs water away from the seam. While most certified installers understand the risks, it not too uncommon to find examples of poorly installed roofs. The first sign is the patches, which indicate that someone has tried remedial action to hold down the edges of the membrane. This does not help since water can get in around the patches. On closer inspection, the corners come away cleanly, and you can see the two surfaces haven’t bonded at all. This is a result of insufficient heat. In fact there’s absolutely no distortion of the asphalt, which indicates that very little heat was used on this (critical) corner join. Upon deeper inspection, I was able to insert a trowel entirely under the membrane, indicating that the problem was not isolated to the corners, but rather all the seams were breached. You could almost see the water being drawn in under the protective outer skin. The extent of the failures in this installation make it difficult to effectively repair (and dangerous too, as it would require multiple instances of applying naked flames). Our advice to homeowners faced with this problem is to rip off the membrane and start again. Ask his protocols, and how he intends to conduct the work on your roof and what materials and temperatures he’ll operate at. Here’s some more advice from the Branz “Good Practice Guide”. SBS can be applied over APP, but APP cannot be applied over SBS – this is due to the elasticity of SBS. New technology has allowed for use of self adhering PMB’s (such as IKO PreVent), where no torching is required. Mastic asphalt is (arguably still a good alternative) as it is spread hot directly onto the roof in one single layer. One final word of caution for wannabe roof installers… Both APP and SBS polymers are destroyed if they’re heated to more than 150˚C, yet the flame on a gas torch is around 425˚C. So your membrane should only be exposed to the flame for fractions of a second. Post script: Torch-on membranes have long been the benchmark for effective roofing. But recent technological advancements in adhesives mean there are now viable “cold-applied” bitumen membranes which eliminate the need for a heat source altogether. This is particularly relevant when refurbishing older wooden buildings, where the potential for fire is greatly enhanced.